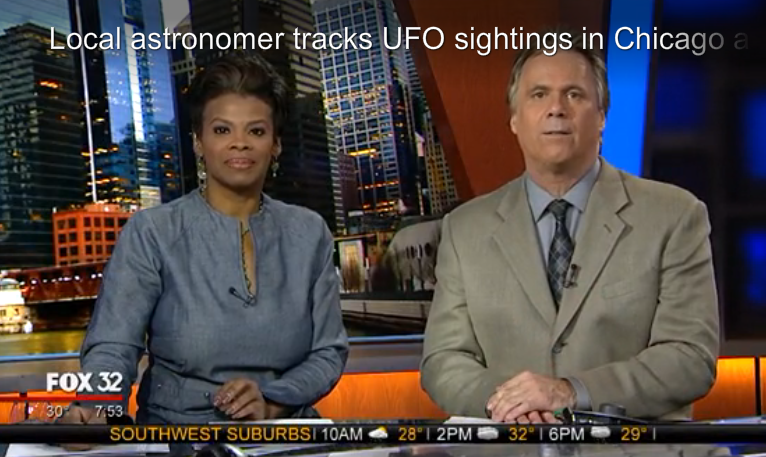 UFO SIGHTINGS DAILY: Astronomer Tracks UFO Sightings Over Chicago Area, Feb 2016, Video, UFO Sighting News. Astronomer Tracks UFO Sightings Over Chicago Area, Feb 2016, Video, UFO Sighting News. I do believe, as technology advances, so will the publics abilities to record and even contact aliens. Technology will arm the UFO researchers with very powerful tools. The one I want the most is a tool that can detect CGI in video to tell me if its real or not. There is an overwhelming amount of fake UFO videos on Youtube and we really need to know the truth, and fakes don't help the cause. CHICAGO (FOX 32 News): Mark Hammergren knows that the truth is out there. An astronomer for the Adler Planetarium – and a confessed X Files fan – he’s lived a life looking up into the stars. And when it comes to reported sightings of UFOs around the Chicago area, he’s heard a tale or two. Mark often gets phone calls at the Adler, with people claiming to see unexplainable lights and objects in the sky – unexplainable until Mark starts investigating. Modern UFO sightings in the U.S. began nearly 70 years ago. During that time, no definitive proof has ever been uncovered. But that doesn’t mean that the search is over, especially for astronomers. A quick Google search of UFOs in Chicago will yield a seemingly never ending trail of rumors, theories and speculation. And Mark will always be there to follow the trail. Because he’s a man who knows the value of looking into the night sky. He knows, somewhere out there, the truth is waiting.